If you are planning your bugout in the spring or summer, don’t forget to think about preparing for inclement weather. That could be a deadly mistake. You may not have the luxury of having to bug out on a beautiful spring day. It might happen in the dead of winter. If it does, are you truly prepared? Do you have the items you need in your bugout bag? Do you know how to deal with the harsh temperatures and the falling snow? Is your vehicle ready to handle the messy streets? Here are some tips that will help. You need to have warm clothing, and you need to have extras that you can change into. Have plenty of extra socks, as they will get wet. Even if you have a great pair of boots, your feet will sweat and when you finally stop to rest, the water in them can freeze and you could have frostbite before you know it. It is important to have multiple methods of making a fire, and you need to know how to find standing deadwood to start that fire. Most of what you find will be wet, so strive to find the driest possible, and be sure you have some fire starters, such as dryer lint, that will help to get the blaze going. Have Mylar blankets that will help you keep warm at night when you rest, and have extra that you can use to reflect the fire to make your shelter warmer. Keep your extremities covered, and make sure your bugout bag can repel the snow and water, as well. If you are taking a tent with you, be sure to pack some extra stakes, so if some break in the cold ground, or if you lose some, you can still put up the tent the next night. 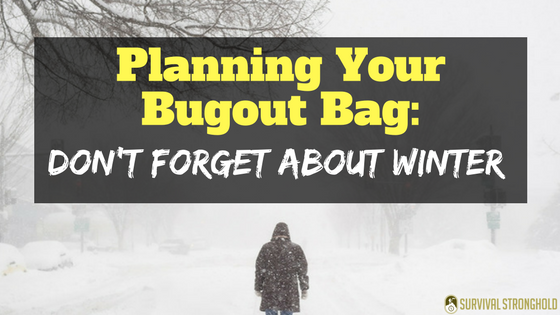 Start thinking about other ways that you can improve your chances of surviving a winter bugout.